As with St. Catherine's Bay, the Royal Bay of Grouville is located on the eastcoast of Jersey and thus we will not find a lot of fortress defences here. We do find Panzermauer 9 here. One of the most impressive examples on the island stretches from Wn Fort Henry to Einsatz Fort William for almost 1 km. Another interesting structure at Wn Fort Henry, which is now covered by the greens of the Royal Jersey Golf Course, is the non standard bunker for Sechsschartenturm. Two of the nine turrets which were shipped to Jersey earlier were about to be returned to France in 1944. Because of D-Day this never happened and so they were placed in non standard bunkers at Wn Dokterhaus in St Ouen's Bay and the earlier mentioned one at Fort Henry. The cupola got scrapped in the 1950s. The fittings of it were, for some unkown reason, left behind in the bunker. 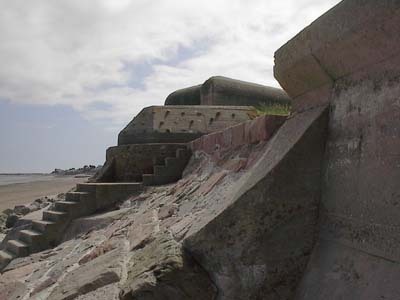 They were dug up by members of the Channel Islands Occupation Society not so long ago and were built into the restored 3-S WaKoFest bunker at Wn La Mare Mill in St Ouen's Bay were they can be seen nowadays. The firecontrol post at Grouville Mill.